Every single one of us have the ability to positively influence our own lives. This is done through your thoughts and actions. Our lives are not set in stone the moment we are born. However, too many people use words like fate or karma to describe their position in life (particularly if it is not where they want to be). They never acknowledge it may be because of themselves. This may also mean that those people do not want to take responsibility for their own actions. So, what is the difference between fate, karma and destiny? Fate is often regarded as the course that life takes, with karma being one of the factors that influence this course. Karma can be described as something you get based on the effort you put out. It is often thought that fate is pre-determined and nothing can be changed. Karma, on the other hand, is the result of your actions. If you do something good, you will get good things in return. Likewise, if you take no action, you cannot expect any return. So how does this relate to destiny? Destiny is often felt to be more in your control, so long as you have the courage to be the excellent person you can be. It is in your moments of decision that your destiny is shaped. If this is true, then you can control your destiny, but not necessarily your fate. Destiny means that there are opportunities to make a decision, and your decision…or choices…will influence the end result. Therefore, you could almost say that fate is out of your control, whereas destiny is what you are meant to do. And if you follow karma, for every good or positive action you take, you will start getting positive returns out of life. So if fate is your life if you did nothing, while destiny is your life based on the choices you make, why not take a few risks to put yourself on the path to greatness. I know why, and it is the R word that I used earlier, which is “risk”. A lot of people do not have the courage to be excellent, as this involves choices. Whenever you have a choice, there is a risk that you may get it wrong from time to time. For most people, the pain of a wrong decision is more powerful than the pleasure of a right decision. If you have the courage to block out this pain and focus on your goal, the world is really yours. But you must be willing to step up. If you have not fulfilled your destiny yet, why haven’t you? Are you happy to let your dreams remain dreams rather than be goals? Are you unwilling to step outside your comfort zone? In saying that, is it really your comfort zone, or just a life that you fell into and cannot get out of? This sounds rather ordinary to me. You have the ability to be extraordinary. When you chase your own dreams, it creates a passion behind your actions. When you are passionate, you create power over yourself. This will allow you to live the life of your dreams….your destiny! It is your responsibility in life to live it to the fullest. As a little exercise, close your eyes right now. Think of a goal that you really, really want. This goal should be something that, if you looked back on your life, you could say that you are proud that you achieved it. You must be passionate about this goal. It must be one that stirs not only the mind, but the emotions as well. After you have come up with that goal, take one step towards it, whatever that step may be. Then write down a plan to achieve it. Then take small steps each day to achieving that goal. Even small steps will gradually walk you out of your comfort zone. And when you are leaving your comfort zone towards a worthwhile aim, you are slowly but surely creating your own destiny. Good luck. If it helps, I will tell you what my martial arts goal is as I write this article. It has just been confirmed that the world championships are on next year. I have competed at the world championships before, where I achieved a bronze medal. However, if I look at myself in the mirror, I do not believe that I competed to my potential at those championships. This was a result of my actions in the lead up to the tournament, which were exposed in the heat of battle. I am really passionate about performing at my absolute best. I can never influence a result of a contest, as there are too many factors at play. However, I can influence how I perform. And I intend performing at my absolute peak. In fact, I start training in 30 minutes time. As I write this, I feel the emotions building up inside and it makes me really excited. I am literally jumping out of my skin. Drop me an email at info@quantummartialarts.com.au to let me know what your goal is. 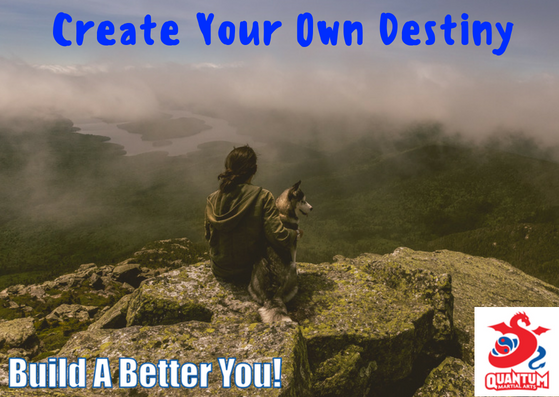 I am more than happy to help support you to create your own destiny.